If we wind up in a situation where the you-know-what has hit the fan, we will be fending for ourselves; we’ll have to do a lot of strenuous activities that we will be unaccustomed to doing, and that means more injuries. Some of those injuries will be minor, but some may be severe such as breaking a bone. Let’s talk a little about fractures and how to identify them without the use of X-rays or other high technology. When a bone is broken, it is termed a fracture. 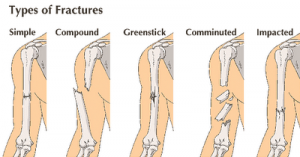 There are several types of fractures, but they are all either “closed” or “open”. A closed fracture is when there is a break in the bone, but the skin is intact. An open fracture is when the skin is broken. Sometimes the sharp end of a broken bone protrudes through the opening. Needless to say, there is usually more blood loss and infection associated with an open wound. The infection may be in the skin (cellulitis), the blood (sepsis), or the bone itself (osteomyelitis) and could be life threatening if not treated. If poorly managed, a closed fracture can become an open fracture. A fracture will manifest with severe pain and inability to use the bone (for example. The patient cannot put any weight whatsoever on a broken ankle). Someone with a sprain can probably put some weight, albeit painfully, on the area. 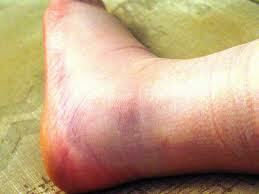 More pronounced swelling and bruising will likely be present on a fracture than a sprain. A grinding sensation may be felt when rubbing a fractured limb. A deep cut in the area of the injury may be a sign of an open fracture. 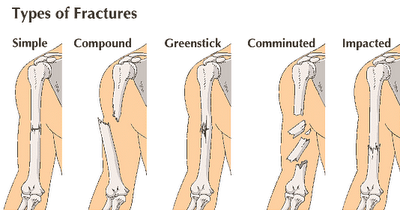 Motion of the bone in an area where there is no joint is another dead giveaway that there is a fracture. 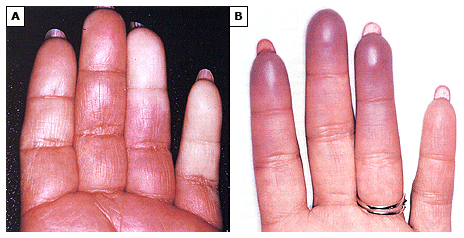 If you notice that your injured finger appears to have 5 knuckles, you’re probably dealing with a fracture! Fractures may cause damage to the patient’s circulation in the limb affected, so it is important to check the area beyond the level of the injury for changes in coloration (white or blue instead of normal skin color) and for strong and steady pulses. To see what a strong pulse feels like, place two fingers on the side of your neck until you feel your neck arteries pulsing. 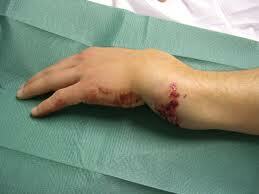 You will do this same action on, say, the wrist, if the patient has broken their arm. 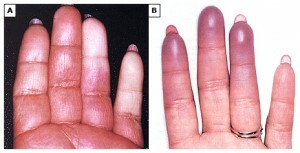 To see what normal circulation does to coloring, press hard on your middle finger with your thumb, then release quickly. You will see the compressed area go from white to pink in less than two seconds if your circulation is normal. If the circulation is bad, it will stay white or turn blue. Next, lightly prick the patient in the same area with a safety pin to make sure they have normal sensation. If not, the nerve has been injured. If the bone has not deformed the extremity, a simple splint will immobilize the fracture, prevent further injury to soft tissues and promote appropriate healing. Popular commercial splints such as the SAM (Splint, Aluminum, Malleable ) splint are useful but you could improvise by wrapping a pillow around the injury and securing with duct tape. This method gives both immobilization and padding. Even some sticks and strips of cloth from a T-shirt will do in a pinch. In this case, you see an obvious fracture of the femur (thighbone) on the left. For one reason or another, this fracture was not reduced. The bone still wants to heal, and the middle E-ray show the bones trying to connect even though the fracture was not reduced. On the right, you see the end result: One leg shorter than the other, and a very likely candidate for a future fracture due to the weakness of the scar. We’ll discuss more about the procedure to reduce a fracture and other factors in assuring good healing in our next article…. Are you prepared to deal with medical issues in times of trouble? With the Doom and Bloom(TM) Survival Medicine Handbook, you will be!